Today we're excited to officially announce support for Binance Coin as a payment method on our payments platform and our gift card service. 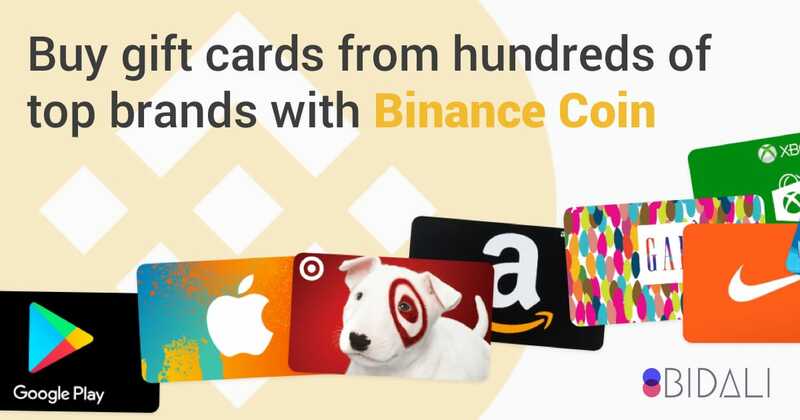 Starting today BNB holders can buy gift cards from over 150 top brands such as Amazon, Ebay, Uber through our gift card platform! In addition to being able to buy gift cards with BNB, now any online merchant will be able to utilize our online payment and accounting software to accept Binance Coin with ease. Online retailers that accept BNB through our payment gateway will also have the option of being paid out in local currency including USD, CAD, Euro, and GBP and having their taxes and conversion rates automatically calculated. Binance is a company based out of Malta that offers a cryptocurrency exchange ecosystem. Last year they acquired one of the most popular cryptocurrency wallets (Trust Wallet) and their CEO, often known by the shortened name CZ, has been making bold moves in the cryptocurrency and blockchain space. Their "Binance coin" (BNB) was initially used as an incentive for coin holders to obtain trade discounts and share in profits with the firm. However, due to the flexible nature of the coin, with the addition to Bidali's ecosystem it can now to be used for payments as well. Binance is one of the most popular cryptocurrency exchanges worldwide and has been driving innovation in the space. We're excited to see where they take things and incredibly proud to be able to offer their users the ability to use BNB for more than just trading. It's now graduated from what looked like a stock or rewards program to a full-fledged currency.